Where can I find the date of my trip? The dates and itinerary can be found on the online profile under the Itinerary section on the left-hand side under My Trips. Under "Leave for your #TripOfALifetime" you will see the departure itinerary, and if you scroll all the way down, you will see your return itinerary listed under "Leave for home from your #TripOfALifetime". 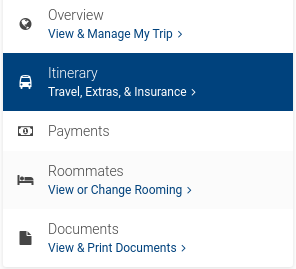 You can click on each title for more specific travel details. If your itinerary is still showing as TBA, or your departure time is listed as 12:00am, just hang tight as we haven't released the itinerary for your group yet. Breakaway Tours bus trips travel over scheduled breaks in the school year to help avoid travelers from missing multiple days of school. All dates are available for each of the trips upon sign up. Once we get closer to the final balance date and we have confirmed each group's size, we will start to assign travel itineraries and hotel information. Once the details are ready to be released, we always send an email to let our travelers know so that they can log into their My Profile to check out all the details! At Breakaway Tours we work with all the major tour operators to your destination. We negotiate group space with them far in advance, sometimes before they have even finalized their flight schedules. Multiple suppliers would serve the same destination and as a result have different availability and space. As group numbers fluctuate we do not permanently assign a final departure slot until after the final payments for the group are received and the final group number is known, however a spot on the trip is reserved with the initial reservation form and deposit. There is a live spot held for each and every registration immediately upon signing up. This is done to ensure that the entire group can travel together on the same itinerary. Final travel times are not released until after the final payments for the group are received. As group sizes may vary and shift between the initial booking date and the final booking date this could affect the allotted space. Our intention is to ensure that all students from the same group have the same itinerary. We also work with the students to try to avoid school events and other issues that could affect their travel plans. We thank you for your understanding. Summer trips are normally planned to depart within the first two weeks in June for American travellers, and the last weekend in June or one of the first two weekends in July for Canadian travellers. Most departures in the summer are Friday to Sunday, but can be potentially Thursday-Monday as the airlines do not fly as frequently at this time. We try to coordinate with the trip organizer to ensure that the dates do not conflict with end of school events such as exams, graduation, or prom. *If you have a specific conflict with a pre-existing event, you should notify the student organizers for your group prior to the final balance date, and we may be able to request alternate dates or make special arrangements.